All amateur players will receive a players pack valued at $40+ and include a special disc, t-shirt and more! 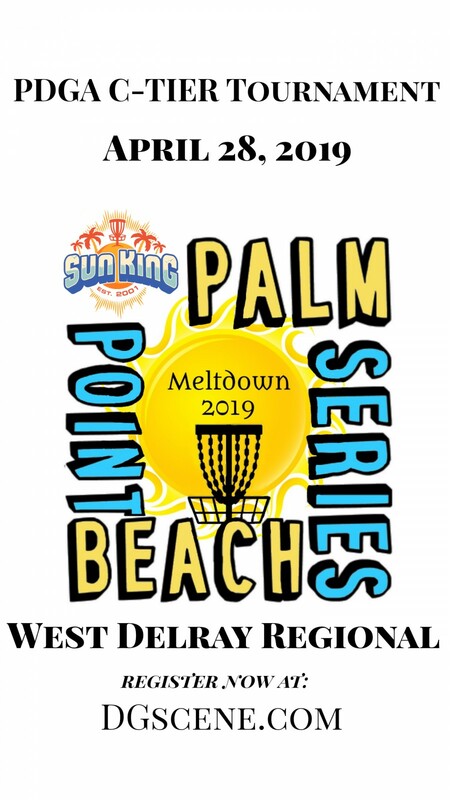 Leading up to the annual Summer Meltdown, Palm Beach Disc Golf is challenging local players to run the gauntlet on all 5 Palm Beach Courses. This Points series will roll into the B Tier at Meltdown as the top 5 players of 6 ratings based divisions will accumulate points leading up to the finale at Meltdown. The Ace Fund at each event, if not hit, will roll over to the next event, and if not hit by meltdown we will have a throw off for the grand total! Sun King will be kicking off the series with the first sanctioned event at the revived West Delray Disc Golf course. Start racking up those points for the right to be crowned champion of Palm Beach Disc Golf!